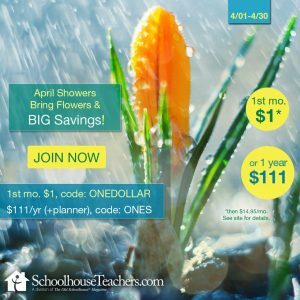 Sign up for homeschool help! Years ago, when my babies were actual babies, I decided to create a special count down to Christmas. 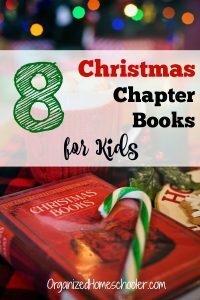 I created a list of the best Advent activities for families so that we would always have something fun to do while we wait for Christmas. I sewed a huge fabric calendar with 25 pockets – one for each day of December through the 25th. Every pocket contains an index card with an advent activity. It isn’t fancy, in fact it might be the tackiest thing I own, but it is special to our family. Lots of memories have been made with this calendar. Young children need something concrete and visual to help them understand abstract concepts, like time. A Christmas countdown calendar helps them see how much longer they need to wait. Each day has a new activity to build excitement and pass the time. Christmas doughnut bar – Decorate doughnuts with icing and Christmas sprinkles. My kids love having a doughnut bar breakfast, especially if we have family visiting. 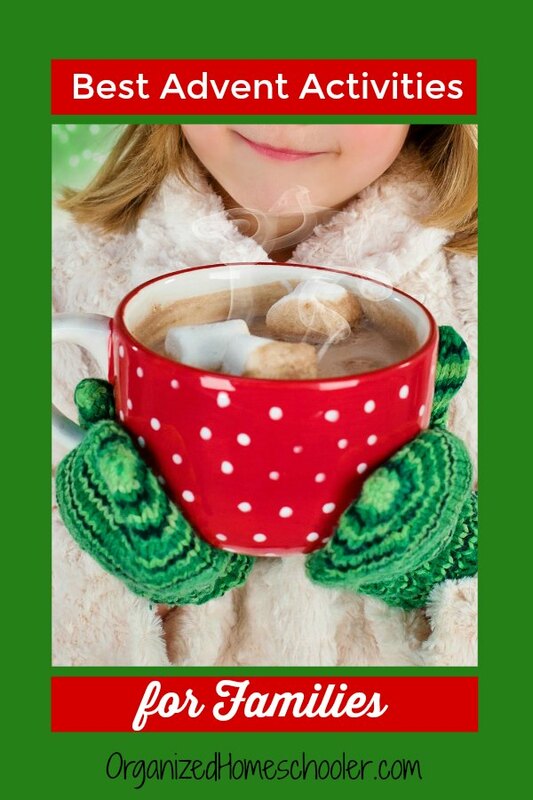 Make hot cocoa and drive around to look at lights – Make sure you give your kids cups with lids! Zoo lights – The name might be different, but many zoos feature different holiday light shows during December. Mail Christmas cards – Even toddlers can add stamps to addressed envelopes. Did you know Amazon.com sells stamps? It is so convenient! Make Christmas shirts – This is Hannah’s favorite Advent activity so we have made this an annual tradition. It all began with these hand and footprint reindeer shirts. This is still my favorite shirt we have made. 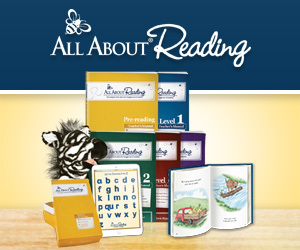 Write a letter to Santa – This is an easy way to sneak in a lesson on formatting letters. Watch a Christmas movie – Que up your Netflix list and find all your holiday dvds now. We own a DVD copy of Elf and my kids watch it almost every week in December. Leave shoes out for St. Nick to fill with candy – This is a fun European holiday tradition. It makes a great start to lessons about Christmas around the world. Bake cookies – Stacy and Matt of Real Everything have a fantastic roundup of paleo holiday cookies, if you are looking for cookie recipes without refined flour or sugar. Make Christmas custard from our family recipe (5 generations!) – This is an annual tradition in our family. Do you have any family recipes? I included our special recipe at the bottom of this post. Make a snowman – We rarely have snow in December so we make it a snowman craft, such as this snowman painting. Try egg nog – This is an easy Advent activity for busy days because you can just pick up egg nog at the grocery store. See the Nutcracker ballet – Professional performances of the Nutcracker are amazing, but typically come with a hefty price tag. Many dance schools host smaller performances with their students that are more affordable for families. Check out a Christmas symphony – When my kids were toddlers we always saw a local high school band perform holiday classics. This is my favorite kind of fundraiser. Take cookies to your local homeless shelter – This can be accomplished by partnering with a church group or contacting the homeless shelter directly. 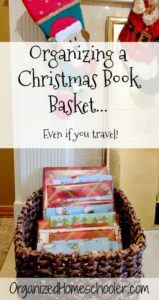 Make an ornament – I love seeing all of our past ornaments each year as we decorate the tree. We are going to try our hand at making these snow globe ornaments this year. Gingerbread Day! – Gingerbread Day is so much fun! We decorate a gingerbread house, bake gingerbread cookies, and play with gingerbread play dough! I bought a few of these gingerbread cookie cutters when I was a classroom teacher and we still use them every year. Make pomander balls – This is just a fancy name for cloves stuck in an orange. They smell absolutely divine. Make reindeer food – Reindeer food (aka oatmeal and sprinkles) just might help attract the reindeer to your house on Christmas Eve. Just sprinkle it on your front lawn before bed on Christmas Eve. Make a birthday cake – We have made a birthday cake for Jesus every Christmas Eve since Hannah was a baby. We always leave out a slice for Santa instead of cookies. Shop for Toys for Tots – Shopping for other children helps my kids think about their own wants a little less. It is a great way to instill giving back while they are young. Go caroling – Round up a few neighbors and go caroling! Take food to the food pantry – I think it important to foster a heart for the less fortunate so we always take food to our local food pantry at Christmas time (and other times of the year). Make wrapping paper – This is a really easy activity for little ones! All you need is a roll of craft paper, stamps, and markers. Let the kids decorate the paper anyway they want. Then use the paper to wrap gifts for grandparents. 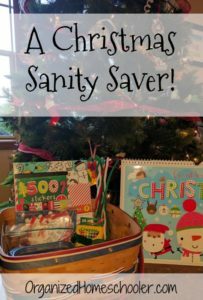 Visit Santa – I only recommend this Advent activity if your child is not afraid of Santa. Advent activities are supposed to be fun, not scary. Visit a historic site – There is something special about the way historical sites are decorated for the holidays. It is a reminder of a simpler time. I recommend Mount Vernon or Williamsburg, if you are in VA.
Track Santa – Every Christmas Eve we track Santa through NORAD’s Santa tracker. It is a fun lesson in geography. Plan it all out before December 1st. This lets you gather materials ahead of time so you don’t need to make any late night trips to the store. Keep a written list with the dates and activities. Check it before you go to bed so you can switch cards if plans change or the weather won’t cooperate. Don’t throw away the cards after you complete the activity! Save them so you have a back up plan. For example, if you are supposed to go to Zoo Lights, but it is pouring down rain, put the movie card or cookies card in its place. 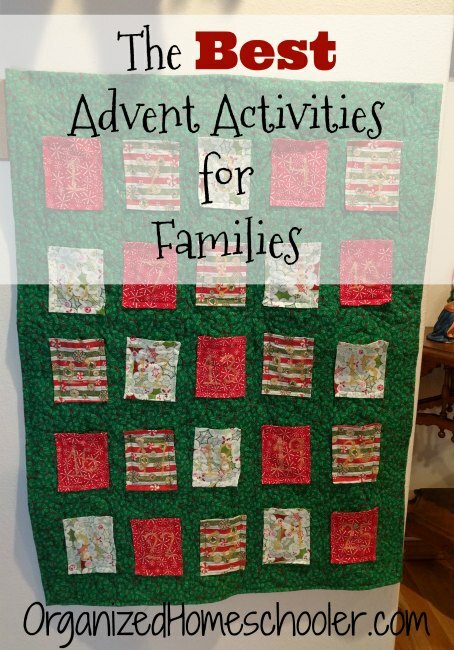 Family Advent activity calendars tend to be fairly large and difficult to pack. Thankfully there is an easy and inexpensive solution! All you need is a file folder and pockets (one for each day of your trip). I had a few pockets left over from our sight word folder that were perfect for this project. Just stick the pockets in the folder and label them with the dates you are away from home. Then pop the corresponding cards into the daily pockets. Make sure you plan activities that are easy while traveling. Ideas like bake slice-and-bake cookies, make hot cocoa, and try egg nog are still festive, but are easy to implement almost everywhere. This recipe has been in my husbands family for at least 5 generations. Paul’s grandmother served it every year at her big Christmas Eve party. Now, we make it with our kids at least once every December. It is a simple recipe, but tastes delicious. Beat egg yolks 1 minute at No. 8 speed with an electric mixer. Add milk, sugar, vanilla, and cornstarch. Bring to a boil, stirring constantly, be careful not to scorch. Cook until the custard covers a spoon. 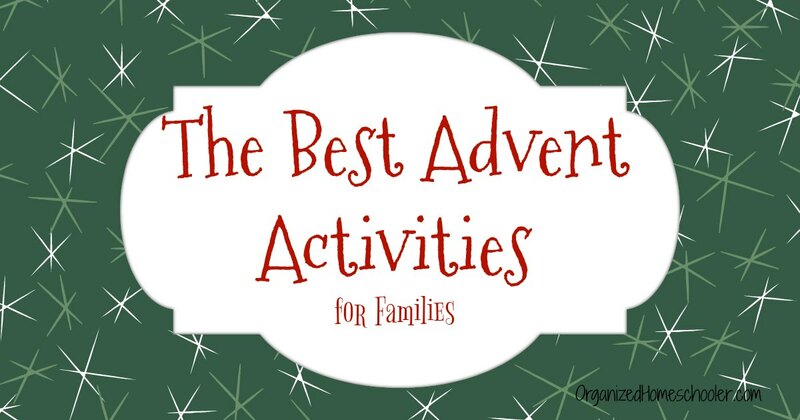 What are your best Advent activities for families ideas? Share them in the comments! Welcome! My name is Jennifer. I am a teacher at heart. Before my children were born I was a public school teacher. Now, I am a homeschooling mom of two. 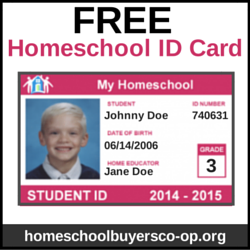 Subscribe to get homeschool help by email.